In announcing Cook as its 2019 commencement speaker, Stanford lauded the CEO's outspoken position on data privacy and other issues that sit at the intersection of society and technology. Cook's efforts to raise awareness about the wide-ranging ethical issues that impact technological progress go hand-in-hand with Stanford's "Our Vision" planning process for faculty and schools, the university said. Our Vision aims "to infuse our role in the technology revolution with ethics and societal considerations" and encourages research on the "societal and ethical consequences of scientific and technological advances [ ... ] to magnify benefits and minimize downsides," according to a website detailing the program. 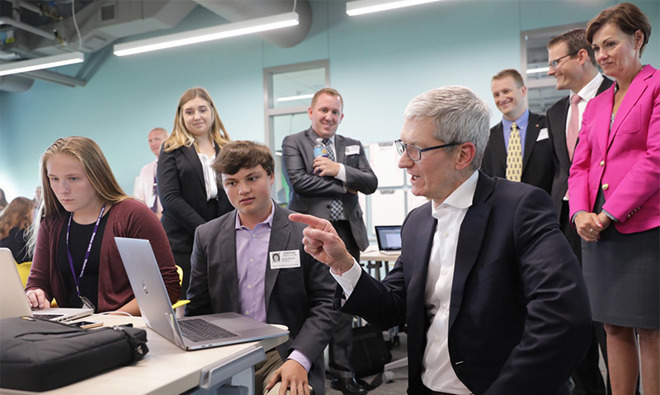 "Tim Cook has spoken forcefully of the challenges and responsibilities confronting corporations and our society today," said Stanford President Marc Tessier-Lavigne. "In tackling these, he has led with vision and values - qualities that reflect the culture of our Stanford community, and that are top-of-mind for our students and our country. Tim was a natural choice to challenge and encourage our graduates as they leave our campus and find their own paths in the world." Beyond a broad list of active employees, including former Chief of the Stanford Center for Digital Health Dr. Sumbul Desai, Apple's ties to Stanford run deep. Most recently the company partnered with the university to facilitate the Apple Heart Study, large-scale research that allowed Apple Watch users to collect data on irregular heart rhythms. Information from the study was subsequently used to build and gain regulatory approval for an atrial fibrillation notification system. Stanford is the second university to announce Cook as its commencement speaker for 2019. Earlier this month, Tulane University said Cook will take the dais at its ceremony in May. The Apple chief delivered similar speeches to graduates of George Washington University and the Massachusetts Institute of Technology in 2015 and 2017, respectively. Last year, Cook delivered the commencement address for his alma mater, Duke University. Steve Jobs did memorable commencement speech at Stanford. The Steve Jobs commencement address was for my graduating class at Stanford. But I was too stupid to be there. I only needed one more credit in my last quarter so I completed it online from my home state of Florida. If I would have known that he was the speaker I would have flown back to CA for it. I only learned about the address when he passed away in 2011. I’m almost tempted to say: There can only be one Stanford speech. I don’t know in how many leadership trainings and others his speech is being shown and used. More seriously...sorry you missed it. He was one of my hero's. Along with Muhammad Ali, Ayrton Senna, Paul McCartney, Obama, and of course Mick Jagger! I have a lot of respect for Tim Cook. He comes across as a thoughtful, calm, well-read, intellectually curious man. I would totally with this assessment based on publicly available information. And, if true, I think it provides him with very strong leadership assets. However, every time I see him delivering a keynote or similar, I catch myself that I’m questioning his ability to lead also by content and technological vision. From work experience, he has an operations background, however not an engineering one. Therefor Ei always ask myself who inside Apple is coming up with the next big thing; who is the visionary that anticipates where the puck will be skating to? Is it a team effort? Two, three people within all Apple? A dedicated group? Everyone with an idea?